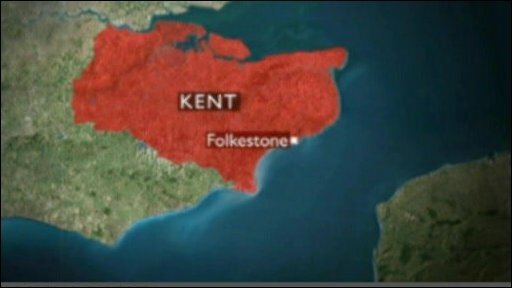 An earthquake has shaken a coastal town in Kent - in nearly the same spot as a tremor two years ago. 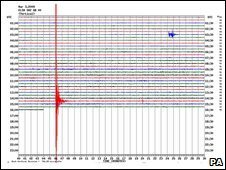 The British Geological Survey (BGS) said it recorded the earthquake at 1435 GMT in Folkestone. Assistant seismologist Julian Bukits said it had a 2.8 magnitude, compared with the quake in 2007 which was 4.3. Resident Terri Julians said the earthquake "sounded like thunder and everything shook". She added: "It was quite scary but amazing." Stewart Smith, who works in the east Kent town, said all the buildings shook for five seconds when the tremor hit. He said offices in the area had been evacuated. The epicentre of the 2007 quake was in the Channel, but this tremor was about three miles (5km) below Folkestone. Mr Bukits said there was an "event near Folkestone" at 1435 GMT, but that "it wasn't anything near as big as the one two years ago". He said the fact that it was not recorded on monitors further away from Folkestone showed it was a very localised event. "There are no reports of damage, but a lot of people will have felt it and remembered the last one," he added. He said a preliminary report showed the tremor had a magnitude of 2.8 - a figure that may go slightly up or down. Mr Bukits said: "On UK terms it's not that huge. "To give a comparison of how often we have a 2.8, I think that occurs four or five times every year." Mr Bukits said scientists were still analysing data from the event. BGS seismologist Brian Baptie said : "It was a very small earthquake, even by UK standards. "It would feel like a truck driving past your house, maybe things on shelves would rattle a bit, but there would be no structural damage expected." He said said five or six earthquakes of a similar magnitude were recorded every year and it was unlikely to be a precursor to a larger-scale event. "Only people right at the epicentre would have felt something that might have caused them alarm." Kent Police said emergency services had received no reports of any structural damage or injuries, but were liaising with partner agencies to ensure officers provided help and support where needed. Sarah Smith, a spokeswoman for Shepway District Council, said: "We have just had a trickle of calls and it is nowhere near the scale of the previous earthquake in 2007, which caused widespread damage to buildings." She said: "The tremor felt like a juddering vibration of the floor that lasted no more than a second. It was very shortlived. "To those who lived through the 2007 earthquake, it was instantly recognisable as a tremor but no one is panicking." Harvey Grammar School was closed as a precaution, she added. 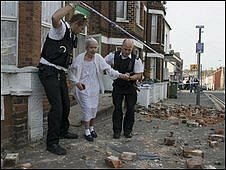 Hundreds of homes in the town were damaged by the tremor in 2007, which had its epicentre a few miles off the coast in the English Channel. Seventy-three buildings were so damaged that residents could not return to them because of loose chimney stacks, tiles and masonry. One person, a 30-year-old woman, suffered minor head injuries. Most residents forced from their homes sought refuge with families and friends, but a small number had to be housed in emergency accommodation.